Visit your local coffee shop with one of our mugs in hand and watch their jaws drop. 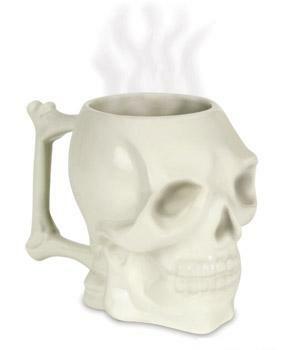 If your morning cup of Joe needs a little Jolly Roger, pour your brew into this ceramic Skull Mug. Each 5" (12.7 cm) tall mug holds about 16 ounces (473 mL) of coffee, grog or rum laced with gunpowder and the handle is shaped like interlocking bones to complete the creepy picture. These have been discontinued by the manufacturer, but we still have some left.